Set on a 174-acre island, surrounded by a fringing reef and crystal waters, 66 Fijian-style bures nestled along the beach and amidst the palms. Dine alfresco at the waters edge or enjoy the music of the "Castaway Islanders." Swim in the pool, snorkel the incredible lagoon, or dive with the fine PADI 5-star Gold Palm Facility. 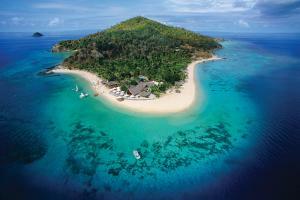 Situated in the Mamunuca Islands, 18 miles from Nadi. One Restaurant and Bar and In-Room Dining.